This time will be different? For those of you not following my Twitter feed (@TMFAssociates), last week there were a couple of interesting developments related to Globalstar, which is currently negotiating with its noteholders under a forbearance agreement (lasting until April 15), after holders of $70.6M of the 5.75% notes exercised their rights to require repurchase of the notes, and Globalstar did not pay the $2M of interest due on April 1. Firstly, Globalstar has been granted received approval from the FCC for the experimental authority it was seeking for tests of its proposed S-band TLPS service, on March 25 for testing in Cambridge, MA and on April 1 (no joke) for testing in Cupertino and Sunnyvale, CA. Globalstar has also told the FCC that it intends to submit further experimental applications “in the near future”. However, the authorizations are for testing only and are “subject to prior coordination with the Society of Broadcast Engineers”, because both locations are within BAS Channel A10 pickup areas. This coordination has apparently not yet taken place, and because the BAS community is rumored to be very unhappy with the situation, it could take some time to reach an agreement. The timeline for the FCC to issue an NPRM setting out the proposed rule changes to permit commercial use of TLPS also remains unclear, but it seems to be taking longer than originally hoped. 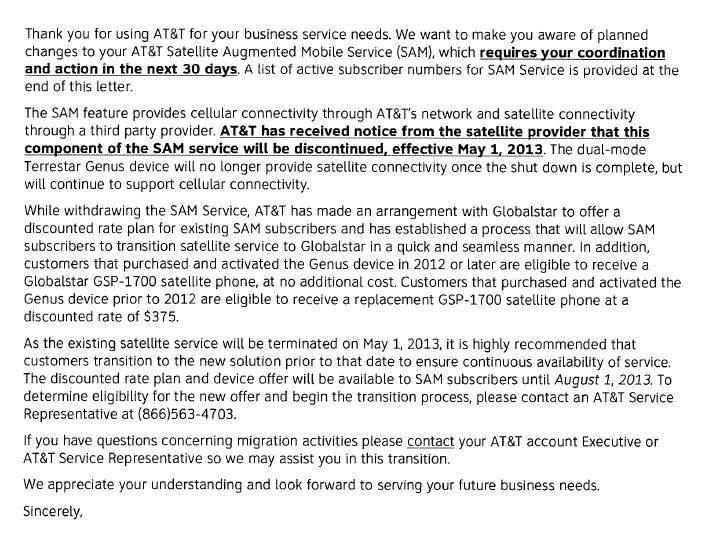 A second recent development is that last week AT&T notified the (less than 1000) subscribers to the TerreStar Satellite Augmented Mobility (SAM) service, that DISH has decided to shut down the service effective May 1, via the letter below, and has “made an arrangement with Globalstar” to offer a discounted replacement rate plan and Globalstar satellite phone. Of course, those with long memories will recall that TerreStar Networks filed for bankruptcy in October 2010, less than a month after AT&T started selling the Genus phone. 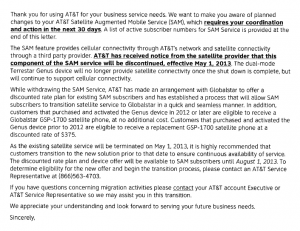 Given Globalstar’s current financial challenges, let’s hope that AT&T’s decision to start selling Globalstar service now is not a bad omen for the company. No alphabet soup for you? Over the last 36 hours there has been a constant stream of stories about DISH Network’s negotiations with various players to launch its proposed wireless network, in what appears to be a last ditch attempt to deflect the FCC from its declared intention to impose strict interference conditions on DISH’s spectrum in order to make the H block auctionable. First we saw reports of DISH’s “exploratory stage” talks with Google, which unsurprisingly led to massive speculation about Google’s desire to get into the wireless business, largely omitting any mention of Google’s previous (financially disastrous) investment in Clearwire, which was motivated solely by a desire to create more competition and cheaper wireless service and had nothing whatsoever to do with enabling Google to become a wireless operator. Now we’ve seen reports about DISH’s unsuccessful bid over the summer for MetroPCS, as revealed in MetroPCS’s preliminary proxy statement filed last night. We also saw DISH highlighting that 3GPP standardization work has been completed, with the implication that DISH could move forward very quickly if the FCC approved the network without new interference conditions. However, it seems clear that the FCC is having none of it, with officials briefing that they are close to a decision, which is expected to confirm that the H block will be auctioned for high power use and therefore the lower part of DISH’s uplink band will face significant powwer restrictions. In other words, the FCC is placing a higher priority on ensuring Sprint has sufficient LTE spectrum (i.e. can extend its 5x5MHz G block LTE network to a 10x10MHz network) and moving forward with an auction of the H block to raise $1B+ than they are on trusting DISH to become a new entrant in the wireless market. In light of the Sprint-Softbank and TMobile-MetroPCS deals, the FCC has achieved its goal of having four viable players in the US wireless market, and so presumably does not see as much need to encourage a new entrant. Indeed I would expect the FCC would be relatively content to see the DISH spectrum go to AT&T, if it could then “encourage” AT&T to sell some of its PCS spectrum to Sprint (along the lines of Verizon’s AWS spectrum deal with TMobile). We might even see a similar “swap” in the PCS band between TMobile and Sprint (with Sprint getting more of the spectrum and paying some cash to TMobile) as an alternative to a potential rival Sprint bid for MetroPCS. After all, TMobile has far more spectrum per subscriber than any of the other three major players (if Clearwire’s holdings are excluded). Does DISH have many other options left to build out a new network of its own, as opposed to selling the spectrum to AT&T and pursuing a merger with DirecTV? There still appears to be uncertainty about the status of a potential deal with Clearwire, though DISH’s 10-Q confirmed (as I suggested previously) that it has raised its stake in Clearwire’s debt by $400M during the third quarter to a total investment of $745M (note that Clearwire is not named in the 10-Q, but the amount invested is too large for the investment to be in LightSquared, given other declared holdings). DISH has undoubtedly talked to almost everyone in the wireless industry, but apparently these talks are currently only at the exploratory stage, which is quite surprising given how much time has elapsed. Of course what the MetroPCS proxy statement reveals is that everyone else has been talking as well, and as set out below, the proxy provides some very interesting nuggets about what’s happened over the last 18 months, once you decode the references to Companies A through H.
Company A: DBSD. MetroPCS determined that DBSD’s spectrum was more attractive than TerreStar’s spectrum and MetroPCS made a binding offer for the spectrum in March 2011, but lost out to DISH. Company B: TerreStar. MetroPCS ultimately decided not to pursue TerreStar, leaving Harbinger out in the cold in June 2011, but then negotiated unsuccessfully with DISH during the summer of 2011 over a potential sale of spectrum, joint venture or contribution of the spectrum in exchange for equity in MetroPCS. Company C: DISH subsequential expressed interest in buying MetroPCS, starting in March 2012 when it became clear DISH would not receive its hoped-for ATC waiver, and ultimately made a bid of $11 per share in August 2012, which was rejected by MetroPCS because it was less than the value offered by TMobile. DISH then indicated that it was unwilling to pay a higher price. Company D: Clearwire. MetroPCS offered to buy spectrum from Clearwire in late 2011 (and earlier had even considered buying the whole company), but was unable to agree on terms. These discussions were revived in June 2012 when Clearwire again suggested a sale of spectrum and a “substantial investor” (Sprint or perhaps DISH???) proposed splitting the company between themselves and MetroPCS. Those “occasional” discussions continued up until the TMobile deal was announced. Company E: Leap. Leap offered to sell “excess” spectrum to MetroPCS in the first half of 2011, but as early as June 2011 had decided to sell the spectrum to another wireless company (Verizon). This implies both that Verizon sat on the Leap deal until it had completed its negotiations with SpectrumCo in December 2011, and that the transfer of the Chicago 700MHz A block spectrum to Leap was presumably only included so the deal could be portrayed to the FCC as a “swap”. (Of course Leap’s presumed follow-up deal of a sale to US Cellular has now been derailed by US Cellular’s exit from the Chicago market and sale of its spectrum to Sprint). In May 2012, Leap asked MetroPCS to consider a combination of the two companies, but MetroPCS decided such discussions would not be productive. Then in July 2012, Deutsche Telekom also raised the prospect of combining Leap with TMobile and MetroPCS, as part of a single transaction, but MetroPCS declined, presumably because of the added complications it would entail. Company F: AT&T. As was widely reported at the time, MetroPCS was in discusssions with AT&T in 2011 about potential asset sales as a condition of the TMobile acquisition. However, this did not come to fruition because the acquisition was blocked by the DoJ and FCC. Later, in August 2012, MetroPCS discussed approaching AT&T, but the consensus opinion was that AT&T would not be interested in buying MetroPCS. Company G: Sprint approached MetroPCS about a potential acquisition in September 2011, and this led to the abortive bid in February 2012, which was vetoed by the Sprint board. Even after this time discussions continued with Sprint, and Sprint indicated in August and September 2012 that it was still interested in an acquisition of MetroPCS. Company H: Verizon. MetroPCS held discussions with Verizon in the spring of 2012 about potentially buying some of the AWS and 700MHz spectrum that Verizon would need to divest to get approval of the SpectrumCo transaction. However, Verizon was not particularly interested in selling the AWS spectrum to MetroPCS (and entered into a deal with TMobile instead). What all this appears to show is that DISH has looked at a number of transactions which involve further investment in the sector, but the main reason these have not come to fruition is that DISH is trying to pay as little as possible for any acquired assets. Alternatively, if DISH was to be a seller, then it was looking for too rich a price (at least for MetroPCS). In this context, it is likely that only Clearwire would be prepared to do a deal to sell assets to DISH on such terms, as I’ve speculated previously. It also seems pretty clear that the potential network sharing deal mentioned in the WSJ article about the discussions with Google would most likely be with Clearwire rather than Sprint, because the benchmark terms set by Sprint’s deal with LightSquared would be unattractive to DISH. As a result, it seems we are back to where we started – could DISH still pull off a deal with Clearwire (and does it want to in the current circumstances? ), or will DISH end up selling its spectrum to AT&T and pursuing a merger with DirecTV instead? Once you’ve stopped laughing at all of this, the meat of the speech is in fact very useful, as the Chairman indicates just how he hopes the “audacious” target in the National Broadband Plan of freeing up 300MHz of spectrum by 2015 will be “exceeded” by a combination of auctions, removal of regulatory barriers, clearing the TV bands and spectrum sharing. First of all, 75MHz of AWS spectrum will be auctioned, including, in 2013, the 10MHz of H-block spectrum desired by Sprint. This confirms that DISH has lost the battle to avoid a 5MHz shift in its uplinks, but in compensation DISH will at least be authorized to use the full 40MHz of spectrum (2005-2025MHz up and 2180-2200MHz down) for a terrestrial network “later this year”. Secondly, an additional 50MHz of AWS-3 spectrum (desired by T-Mobile) will be auctioned, based on spectrum sharing with the DoD in the 1755-1780MHz uplink band. Finally, AT&T will get its rebanding of the WCS spectrum approved. The Chairman even indicates that the FCC is “working with stakeholders to enable use of the portions of the mobile satellite spectrum in the L- and Big LEO bands [i.e. LightSquared and Globalstar] for terrestrial service” although notably this spectrum is not included in the 2015 total, indicating that these efforts may not be concluded quickly. The most obscure reference is in the unstated 15MHz balance of AWS spectrum planned for auction before 2015. Given the short timeframe, this can only be the 1695-1710MHz spectrum being reclaimed from NOAA. Presumably this block will be made available as uplink spectrum (because it is adjacent to AWS-1 uplinks at 1710-1755MHz) and as such it will be attractive for AT&T to pair with the WCS spectrum (which will probably all be converted to downlinks). However, this leaves LightSquared in a bind over the spectrum “swap” it proposed last Friday, because LightSquared does not want more uplink spectrum (let alone having to buy it in an auction), and after giving up the 1695-1710MHz block, NOAA will need to use the 1675-80MHz band even more intensively for weather balloons. Looking at the bigger picture, the situation may be made more difficult not just for LightSquared, but for DISH and Clearwire as well, because the FCC’s actions appear designed to give all of the major wireless operators the spectrum they are hoping for in the near term. Specifically, the FCC intends to free up the H block for Sprint, the AWS-3 block for T-Mobile and 1695-1710+WCS for AT&T, while Verizon has already had its SpectrumCo purchase approved. Especially in the wake of yesterday’s T-Mobile/MetroPCS merger, this makes me wonder just how many attractive alternatives Charlie Ergen still has to a deal with Clearwire for buildout of his 2GHz spectrum? Surprisingly little attention is being given to Charlie Ergen’s upcoming PCIA keynote speech on October 3, where he is set to “discuss DISH’s wireless plans” and will be followed by a Q&A session with FCC Chairman Genachowski. This may be due to the fact that many analysts believe DISH are unlikely to build out a wireless network and will instead seek to sell their spectrum to AT&T. Support for this view comes from the narrowing field of potential partners for DISH, with DirecTV indicating last week that “it’s hard for us to see why we would want to go and compete in [the wireless] space”. DISH have also been pushing back at the FCC on the proposed shift of their uplinks by 5MHz into the 2005-25MHz band, claiming that a 5MHz buffer is needed between their spectrum and BAS operations above 2025MHz, and that a shift would cause serious delays for their network buildout plans. However, our BAS industry contacts indicate that any interference issues would be largely manageable, and so many believe DISH may struggle to win this battle on interference arguments alone. However, I think that in fact the chances of any spectrum sale to AT&T in the near future are rather low, unless DISH can put forward a wireless business plan that scares AT&T into making a knockout bid for the company. Indeed it is in AT&T’s interests to sit on the sidelines if they expect DISH to struggle with network buildout and customer acquisition, because then the potential price for taking the assets off DISH’s hands would most likely go down, and AT&T does not need (and could not use) the 2GHz spectrum band for several years. As a result, whether or not a deal with AT&T remains a possibility, DISH now need to come up with a concrete plan for their network buildout as well as partnerships that AT&T would consider a real threat. Some of these pieces now appear to be coming together, and the first details may even emerge as soon as next week’s speech. With regard to a network buildout plan, it is interesting to note that DISH have apparently been building a significant stake in Clearwire’s first lien debt, which totaled almost $400M at the end of June and may now be considerably higher. Clearwire have also been highlighting the potential for “asset sales” to raise the money required to complete their planned LTE buildout. A deal which could meet the needs of both DISH and Clearwire would be for Clearwire to sell its existing WiMAX network and retail customer base to DISH for something like $1B to $2B in cash (and Clearwire debt?) and then enter into a network sharing agreement for Clearwire and DISH’s separate LTE buildouts. This would allow DISH to acquire a network covering 130M+ people (and perhaps more when moved to the 2GHz band) at a very substantial discount to the $4B that Clearwire have invested in their network to date, and enable DISH to offer fixed wireless broadband to their existing satellite TV subscriber base. Indeed, by adding an outdoor 2.5GHz terminal alongside their satellite TV antennas, DISH could extend the range of the 2.5GHz WiMAX network to cover considerably more people compared to existing indoor modems. DISH would also presumably develop a dual mode 2.5GHz WiMAX/2GHz LTE (and perhaps 2.5GHz LTE) handset to provide an evolution path for Clearwire’s handheld customer base. Meanwhile, Clearwire could substantially reduce their network costs and gain additional income from leasing 2.5GHz spectrum to DISH for the next several years. The second part of the puzzle is who DISH’s partner(s) for their wireless operation might be. Obviously AT&T and Verizon could not be partners, and after their AWS spectrum deal with Verizon, T-Mobile are almost certainly out of contention. Sprint have been looking for a hosting customer similar to LightSquared to help defray the cost of Network Vision, but if DISH enter into a network deal with Clearwire then that would likely rule out a partnership with Sprint (though Sprint’s wholesale WiMAX customers would continue using the Clearwire/DISH network for the time being). With DirecTV also now on the sidelines, it looks like DISH’s partner would have to come out of left field, and the only obvious option there would be Carlos Slim (and presumably America Movil). Its worth noting that Slim already appears to be interested in MSS spectrum, given he is probably the only remaining credible possibility for the mystery LightSquared investor that many thought was Ergen earlier this year, and he has an existing relationship with Ergen in Mexico, so a deal here would not be that much of a surprise. The biggest unknown is how much of this unfolding story will emerge next week at PCIA. With the FCC not expected to approve DISH’s request for terrestrial use of the AWS-4 spectrum until later in October, it may be risky to reveal too much right now. If an announcement does come next week, then it will also come as a major shock to most wireless industry observers, because almost no attention is being given to the possibility of a tie-up between DISH and Clearwire. However, this may be the last chance for DISH to pressure the FCC not to shift their uplink spectrum, and a major announcement of network plans could tip the scales in their favor. As a result, I suspect that Ergen’s speech could well contain an announcement of a network deal, a partnership or perhaps even both. It looks like the next month or so may be filled with interesting developments in the US spectrum market. Last week, it was reported that the FCC is preparing to launch of review of its “spectrum screen” at the September Commission meeting. Of course if the FCC suggests a preference for distinguishing between low frequency (sub 1GHz) and higher frequency spectrum, in response to concerns that AT&T and Verizon have been accumulating too much of the most valuable spectrum, then that might not only put a damper on the prospects for broadcast TV incentive auctions (recall that AT&T and Verizon contributed over 85% of the 700MHz auction proceeds back in 2008), but could be taken as a clear signal that the FCC would approve of AT&T buying DISH for its higher frequency spectrum. In that context, it seems increasingly likely that the release of a LightSquared ruling (almost certainly confirming the FCC’s February proposal to withdraw LightSquared’s ATC license) will also come this month, along with approval of DISH’s terrestrial network in the 2GHz MSS band. This week DISH has been continuing its campaign to avoid its uplink allocation being shifted up by 5MHz to 2005-2025MHz, which is an option being considered very seriously by the Commission, as it would satisfy Sprint’s desire to access the H-block (which Sprint probably considered to be a done deal last November when it settled with DBSD and TerreStar), and mitigate both windfall and timeline concerns. However, it is notable that the Public Interest organizations who have been most vocal in raising the windfall issue actually oppose a relocation of the uplink due to the delay it would could in the standardization process. Intriguingly, if we do see a ruling (at least partly) in DISH’s favor in the next month or two, it may make it even more difficult for Clearwire to pull off any potential spectrum sale. Then we may be faced with exactly the same situation in December as at the end of last year, namely does Clearwire pay the large interest payment due in December, or use the threat of a bankruptcy filing as leverage to raise more money from Sprint and others to fund it through next year. LightSquared is also wheeling out the big guns in its lobbying campaign right now, with former FCC Chairman Kevin Martin lobbying the Commission on LightSquared’s behalf last week, and the company is once again ramping up attempts to get its side of the story across. This may raise a few eyebrows, given that Martin was key to approving ATC back in 2005 and then requiring Inmarsat to cooperate with LightSquared via their Dec 2007 agreement. However, it seems unlikely to change many minds at the Commission, especially in advance of the November election. Apparently the best that LightSquared could hope for is for the initial decision to be taken by the full Commission, rather than by the International Bureau on delegated authority, which would give LightSquared an earlier opportunity to challenge the decision in court (because an IB decision must first be appealed to the full Commission before any legal action is initiated). After LightSquared’s attempts to insert consideration of its own situation into the DISH proceeding, it would seem natural for both rulings to emerge at about the same time. The FCC will also need to indicate in the DISH ruling how it plans to take forward any similar flexibility proceedings in other MSS bands, notably the Big LEO band, where Globalstar has emphasized that “Greater flexibility for mobile broadband in Big LEO spectrum [is] necessary to enhance financial viability of Globalstar and its mission-critical MSS offerings” (emphasis mine). With Globalstar looking to raise substantial financing (perhaps as much as US$250M to $300M if Globalstar aims to fund both the remaining satellites and the ground segment buildout) by the end of the year in order to move forward with the final phase of its second generation constellation buildout, it is plausible to conclude that a positive signal from the FCC in this regard within the next month or two may be a pre-requisite for completion of that financing (which would presumably involve a combination of additional Export Credit Agency funding and further investment from Thermo). Finally, and separately, TerreStar Corporation appears to have basically resolved its bankruptcy, and the existing preferred shareholders will convert their holdings to equity and keep control of the company. It is interesting to note that the valuation put on the 8MHz of national 1.4GHz spectrum in the event of a liquidation was only $80M to $100M (or $0.03-$0.04/MHzPOP) for an M2M smart grid type network (which is gratifyingly close to my estimate of $60M to $100M two years ago at the beginning of this process). It is hoped that FCC waivers can be secured, which would make the spectrum more valuable and usable for LTE, but that is a long term process, and there is no guarantee that it will be attractive to manufacturers to include this small, isolated band in future LTE chipsets. As a result, although there is a proforma offer for sale of the spectrum, it is inconceivable that any bid would be higher than the $400M+ that the existing preferred holders could credit bid in any auction. Of course its also another example of how just assuming spectrum is always a valuable asset, without consideration of the limitations applicable to that spectrum, is a quick way to lose a lot of money. So going back to my title above, the next few months should reveal a lot more about who’s going to show that they’re an “All Star” and who will prove to have “the shape of an L on [their] forehead”. However, one thing seems pretty clear: when the FCC announces its decisions, not everyone is going to be a winner. What is AT&T up to on the down low? Earlier today AT&T announced details of its new proposal with SiriusXM to resolve disagreements over how to deploy mobile broadband in the WCS band. AT&T is the largest holder of WCS spectrum, with about 4B MHzPOPs of spectrum, and NextWave is the second biggest holder. However, there is a difference in usability within the WCS spectrum between the C&D blocks (unpaired 5MHz blocks) that are immediately adjacent to the 2320-2345MHz satellite radio (DARS) band (and so have a much higher risk of causing interference with satellite radio receivers) and the A&B blocks (each a paired 2x5MHz channel) which are further away from the DARS band. AT&T and Sirius’s proposal would sharpen this difference by prohibiting mobile use of the C&D blocks, while further liberalizing use of the A&B blocks. As a result, AT&T would then have between 10MHz and 20MHz of usable A&B block spectrum over roughly half the country. The result of this proposal would likely make NextWave’s life more difficult (because nearly half of its WCS holdings are in the C&D blocks), thereby potentially giving AT&T a chance to pick up additional A&B block WCS spectrum. However, what is particularly intriguing about the details of AT&T’s submission is the proposal that it should be allowed more flexibility to deploy FDD technologies such as LTE, with downlinks in both halves of the WCS A and B blocks. In other words, AT&T would gain yet more downlink spectrum, in addition to the Qualcomm 700MHz spectrum that it acquired last year “to allow support of asymmetrical data bandwidth allocation”. Of course, the obvious unanswered question is where would the uplink spectrum to be paired (under the proposed FDD configuration) with both the Qualcomm and WCS A&B block spectrum come from? What AT&T needs is a clean block of paired spectrum for an LTE Advanced deployment so that the Qualcomm and WCS spectrum can be used as carrier-aggregated downlinks. When it proposed the Qualcomm transaction, the scenario that AT&T advanced was to use the AWS band to serve this purpose, but of course that is now off the table with the collapse of the T-Mobile takeover. As I’ve noted before, the Qualcomm transaction alone therefore provides a pretty compelling reason for AT&T to be interested in buying DISH. However, another fascinating possibility is that perhaps Moelis’s assertion last week that LightSquared’s spectrum would still be worth a considerable amount of money if used on an unpaired basis (i.e. as uplink only spectrum) might be grounded in something more than wishful thinking. Indeed Moelis cites the potential for at least some of LightSquared’s spectrum (the 1670-75MHz block leased from Crown Castle) to be paired with other spectrum blocks through carrier aggregation “similar to AT&T’s planned usage of Qualcomm’s 700MHz spectrum” and I’m told that this possibility has been explored with AT&T in recent months. Of course, GPS interference concerns in LightSquared’s satellite band would still need to be resolved, and LightSquared would still need to pay for leasing spectrum from Inmarsat (according to Moelis’s figures the lease payment if the full L-band band is usable has now been increased to $145M p.a. from April 2014 under the revised agreement struck with Inmarsat in April). Even then, uplink spectrum is generally worth much less than downlink spectrum, both because there is a need for additional downlink spectrum due to traffic asymmetries and, as LightSquared found out to its cost, interference concerns can be more problematic in downlink spectrum. As a result this severely undercuts Moelis’s argument that LightSquared should be able to attribute the same valuation to its spectrum whether it is used for uplinks or downlinks (not to mention the use of comparisons based on recent sales within the well established and widely deployed AWS-1 band). However, this possibility does at least raise the question of whether AT&T’s acquisition plans (which are intended to give it enough spectrum for the next five years) include options other than buying both DISH and Verizon’s 700MHz B block spectrum. What a bizarre day in the world of LightSquared, where it appears nothing is ever as it seems! First of all, a comment yesterday on my last blog post gave some hints as to a completely different way to think about why Charlie Ergen might be interested in acquiring LightSquared’s spectrum, despite the current roadblock imposed by GPS interference concerns. Specifically, why couldn’t LightSquared’s L-band MSS spectrum be repurposed as uplink-only spectrum and then paired with the DISH 2GHz spectrum, which could all be converted to downlinks (a proposal already made in the FCC’s 2GHz NOI)? Then Ergen would have access to a total of up to 80MHz of spectrum which could be authorized for terrestrial use (four 10MHz uplink blocks in the L-band and two 20MHz downlink blocks in the 2GHz band). As I pointed out in my reply to that comment, there are certainly some GPS interference concerns expressed by the NTIA over handsets operating in the portion of the L-band uplink closest to GPS (1627.5-1637.5MHz) and presumably these concerns would be considerably greater for uplink use of the 1545-1555MHz block because it is even closer to GPS. It would also be very hard to develop handset filters which could comply with the onerous ATC out of band emissions limits above 1559MHz (something that is easier to address for downlink use on a tower, where physical size and power requirements are less of a constraint), presenting further issues for uplink use of the 1545-1555MHz block. However, even if these two bands were dropped from the initial deployment plan and only three of the four bands were used eventually, DISH could still benefit hugely from having access to 40MHz of downlink spectrum instead of 20MHz. Indeed DISH might even be able to sell off or lease some of this spectrum to another operator and still build a network. This guesswork seemed to be supported by LightSquared’s April 25 letter to the FCC, asking for the L-band to be addressed within the 2GHz NOI, so that “cross-band” solutions could be considered. The counter-argument is that any such change would obviously delay the process of authorizing and then building out DISH’s network considerably (most likely by 1-2 years), and therefore might not be acceptable to either DISH or to the FCC Chairman (assuming he is focused on maximizing the speed with which the 2GHz spectrum is brought into terrestrial use). However, later in the day, news emerged that Harbinger and the debtholders have agreed on a change to the First Lien Debt Agreement, adding DISH specifically to the list of Disqualified Parties who are not allowed to purchase the debt (this section previously just referred generically to strategic purchasers). That would suggest Harbinger are not interested in some form of accommodation with DISH along the lines of the above “cross-band” spectrum pairing. Even more bizarrely, I have had people insisting to me that it is definitely not DISH who is the purchaser, and Ergen is not formally denying an interest simply because he wants the LightSquared debtholders to be even more confused about his intentions, while he moves ahead with his plans in the 2GHz band. It was indicated to me that various people have already been spreading misinformation, for example when the WSJ was told that Falcone had agreed to step down (which I’m told he hadn’t), and when the New York Post was told that Falcone had not been presented with an economic proposal by the debtholders (which I’m told he had). According to this version of events, the New York Post story that “Ergen bought the debt” is similarly misleading and may even have been encouraged by Falcone and his advisors in order to persuade investors that there is strategic value in the spectrum. Of course that version of the story might just be wrong as well. At this point what we do know is that Sound Point has a deep pocketed backer who is trying to acquire a significant amount of the LightSquared debt. If it’s not Ergen, then it is very hard to understand who would have a strategic interest in the spectrum at anything close to the price they are paying. We don’t know the intentions of the buyer, but it seems that they are probably not friendly towards Harbinger and would presumably therefore seek to force LightSquared into bankruptcy on Monday when the waiver expires. Whether they will gain support from other debtholders in doing that remains unclear, but it does seem that Falcone’s threat of a voluntary bankruptcy may not be give him as much power to dictate the outcome of this week’s negotiations as first thought. Most people certainly seem to think that another extension of the negotiations beyond next Monday is fairly unlikely and a resolution one way or another will be reached by then. As a result we seem set for another few days of briefing and counter-briefing, in a situation where almost no-one knows who is telling the truth and who is bluffing. With $1.6B of debt and billions more in equity at stake, it really is going to be a game of high stakes poker this weekend. Last year most attention was focused on the October 2010 bankruptcy of TerreStar Networks, which owned the 2GHz satellite assets that Charlie Ergen purchased last June for $1.4B. Much less attention was paid to its parent, TerreStar Corporation, which filed for bankruptcy in February 2011 and owned the 8MHz of spectrum in the 1.4GHz band that was leased to LightSquared in September 2009. The reorganization plan for TerreStar Corp contemplated that this lease (under which TerreStar receives $2M per month) would remain in place, and the company would be handed over to its preferred shareholders, led by Highland Capital, Solus and Harbinger. However, this plan now seems to be on the verge of unraveling after Harbinger dumped its Series B preferred shares (which had a face value of more than $100M) earlier this year (keeping only the worthless subordinated Series E shares), presumably so Harbinger could repay its $400M UBS loan at the end of January. These shares were picked up West Face, but Harbinger then promptly stopped making the monthly payments on the 1.4GHz lease, with TerreStar Corp’s March 2012 results now showing $2M of accounts receivable due from LightSquared, whereas in previous months this revenue has been booked as it is received. Now TerreStar Corp has been forced to postpone the confirmation hearing (originally set for April 11) and hire counsel to help figure out what options remain for the 1.4GHz spectrum. Most observers appear to agree that the Harbinger lease was above the market value for this spectrum, and Harbinger appears to have been unable to find anyone interested in taking over the lease when it attempted to monetize the spectrum in January this year. It remains unclear what recourse TerreStar Corp might have to sue LightSquared to recover the lease payments, given that LightSquared Inc, which controls the lease and is the parent of LightSquared LP (where most/all of the cash is held) appears to have few resources of its own. So now the question is what happens next for TerreStar Corporation? Will the 1.4GHz spectrum be offered for open sale? Do Solus, Highland and West Face really want to own this spectrum? How will a valuation (and a potential cramdown of Elektrobit, which is an unsecured creditor of TerreStar Corp) be agreed without the lease? Whatever happens, this certainly looks like yet another mess that Falcone has got his one time partners at Solus into. Since news emerged yesterday that Carl Icahn had sold his $250M of LightSquared’s first lien debt at around 60 cents on the dollar there has been feverish speculation about whether someone else is backing Sound Point Capital, the small investment firm that bought the debt. Today that led to the price of LightSquared’s debt being bid up to almost 70 cents on the dollar, as investors wonder if a strategic player is interested in the company. Attention has focused on Charlie Ergen, because of his record of doing the same with DBSD and TerreStar last year, with the Reuters article which broke news of the sale indicating that Ergen was previously an investment banking client of Sound Point’s principal. Notably, in both cases Ergen acquired debt of the companies before bankruptcy and then bought the assets out of bankruptcy, with the debt investors ultimately getting paid back at par. Ergen was even asked on today’s DISH results call if he was “interested” in LightSquared’s spectrum, but deflected the question by responding that DISH has all the spectrum they “need”. Everyone knows Ergen is not going to build out a network. No one trusts him, including the FCC. They are not going to put their eggs in that basket because they know he will make them look foolish. It is inevitable. This guy, as smart as he is, will never build the network. He is using it as bait so one of the big guys step up and attempt to pay him for a dwindling subscriber base. Dish and Ergen are on the downward slope of a steep hill and he knows that, hence his aggressive acquisition tactics over the last 12 months…. stay tuned…. Of course we don’t yet know who, if anyone, is behind the purchase of Icahn’s holdings. Even if it is Ergen, then he could have a range of motivations, ranging from a defensive move to ensure LightSquared doesn’t disrupt the current FCC proceeding to authorize terrestrial use of the DBSD/TerreStar 2GHz spectrum, to a desire to help the FCC out of a hole, all the way to seeing a long term opportunity to make the L-band spectrum useful for terrestrial service. Indeed several of these factors could be in play simultaneously. UPDATE: The New York Post is now reporting that Ergen was the buyer and he picked up another $100M of debt last week in addition to Icahn’s $250M holding. However, one important consideration to bear in mind when drawing parallels with DBSD and TerreStar is that in those cases the spectrum was owned free and clear (whereas LightSquared has an expensive lease contract with Inmarsat, albeit one that is currently on hold) and (in the absence of a spectrum swap) the GPS interference problems in the L-band mean it will be many years before even a portion of the band (likely at most 20MHz) is usable. Both those factors will significantly depress the value of LightSquared’s spectrum relative to DBSD and TerreStar (where Ergen paid $1.4B-$1.5B for 20MHz of spectrum from each company) and make it much harder to justify paying anything close to the $1.6B par value of LightSquared’s debt simply to acquire LightSquared’s spectrum assets. 1. Escalating commitment by Falcone, who kept devoting an increasing proportion of Harbinger’s assets to SkyTerra/LightSquared (and other spectrum projects such as TerreStar), despite Falcone’s apparent awareness of the GPS interference problems and the lack of interest from wireless operators in buying this (or any other MSS) spectrum. Similar to Motorola, Falcone’s history was that similar bets (e.g. in subprime mortgages and iron ore) had paid off in the past and so just as with Motorola he has maintained his “arrogance” that “the investment thesis was dead-on“. 2. Unwillingness to cut losses, because Harbinger’s investment was in equity, which would all be wiped out if Falcone did not continue with the project, but the chance of a recovery could be preserved by raising additional senior debt from third parties (just as with Iridium, where the bondholders also got stuck with a 99% loss because in the end the assets were essentially worthless). 3. Lack of corporate governance, because Falcone was able to make whatever bets he wanted with Harbinger’s money, despite the fact that as another Bloomberg interviewee pointed out “There should have been constraints on risk and concentration of the investments”. In addition, SkyTerra’s board was focused solely on trying to raise money and then sell the company to someone else (Falcone) rather on whether they actually had a viable business at the end of the day, because they could never hope to fund a terrestrial network buildout themselves. As I’ve pointed out before, it took nearly nine months after the Iridium bankruptcy filing in August 1999, before the investors actually realized that the assets were worthless (and considered de-orbiting the satellites), during which time even as smart an investor as Craig McCaw considered a multi-billion dollar commitment to rescue Iridium. Indeed in the end McCaw and others actually committed $1B+ to rescue the similar ICO project, much of which now looks to have been wasted after ICO’s jury verdict against Boeing was reversed last week. As we look to what will happen next, I’m therefore left wondering if history will once again repeat itself, with Icahn in the role of McCaw, and a decade long court case in the offing.